In India, National Oil marketing companies have increased the prices of bituminous products for the first fortnight of April, 2019 wef 01/4/2019. All the grades of Bituminous product prices are revised up by around 0.4 pct from previous prices. As per the latest publication of oil marketing companies, In Visakha, The basic prices of Bitumen VG-10 (Bulk), Bitumen VG-30 (Bulk), Bitumen VG-10(packed) and Bitumen VG-30(packed) product prices were up by Rs.120 per Mt each to Rs.28720/-, Rs.28920/-, Rs.32020/- and Rs.32820/- per Mt respectively. 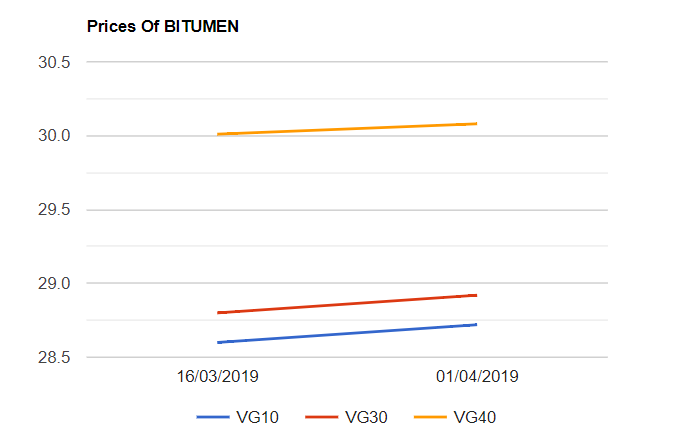 Bitumen VG-40 Bulk product prices went up by Rs.70/- per mt to Rs.30080/- per Mt.